Startups, app developers and entrepreneurs have been disrupting the publishing industry quite a lot lately. New ways to publish books, like ScrewPulp, have made it so writers can get to market quickly and without the help of a major publishing house. These kinds of distribution startups are bringing an almost indie music renaissance to the world of publishing and writing. The publishing world was a hard nut to crack, though. Traditional writers have been leery of technology, seeing e-books and mobile devices as a replacement for the true craft of publishing books. Over the years apps in the publishing industry have become more and more common place. At least that’s what the team behind WritePlan is hoping. 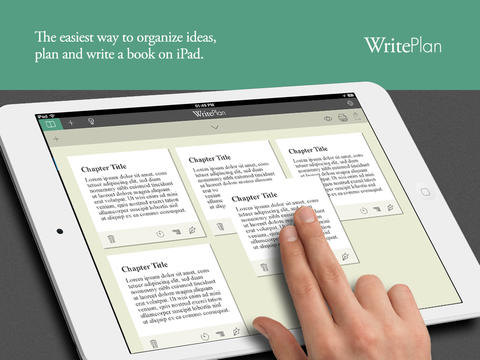 WritePlan is a new way for writers to outline their books. Outlining is one of the most important steps for a writer after the initial idea phase. Now, having a smartphone on the bus, in the car, on the subway or even just relaxing on the countryside means that a writer can quickly jot down ideas for their outline in a very clean user friendly interface. “The biggest forces working against successful completion of a book are demotivation and distraction. The WritePlan app serves as a motivating force in a writer’s life, helping battle writer’s block and keeping the writer focused with word count challenges to encourage and motivate daily writing. The clean, simple interface offers writers a screen without distractions that often lure them away from creation.” the company said in a statement.